The Algiers–Boumerdes regions were hit by an M w 6.8 destructive earthquake on May 21, 2003. The accelerometric and seismometric networks successfully recorded the main shock and many aftershocks at some locations where the damage was most extensive. A microtremor measurement was performed in the same locations; some of them are localized on the Mitidja basin. 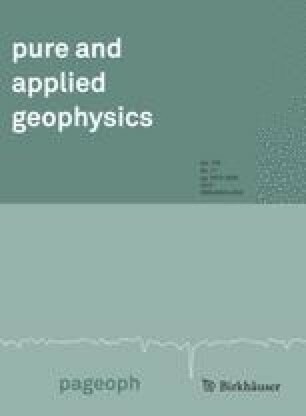 In this paper, we propose to analyze earthquake-induced site effect derived from horizontal to vertical spectral ratio from ambient noise (noise horizontal to vertical—NHV), or from very weak, weak, moderate and strong ( peak ground acceleration—PGA >10 % g) seismic motions (EHV), and transfer function evaluation from soil velocity profile data at four sites. H/V spectral ratios are computed by using both Fourier and response spectra. Compared to the transfer function, the obtained results show that in the case of soft soils, NHV as well as EHV give a good estimation of the soil's fundamental frequency, whereas the NHV underestimate the H/V amplitude and the EHV amplitude increase with the seismic motion intensity. In the case of firm soils, whereas the NHV gives flat curves synonymous for a rock site or a bump, the EHV is more appropriate as seen by identifying clear peaks with non negligible amplitude. In the case of soft sites as well as in the case of firm sites, strong peaks at frequencies higher than the fundamental one are found from EHV curves. Those peaks would not be found when looking at NHV ratios alone, are evidenced by the computed transfer function as well as by an analytical formulation, and are in agreement with the observed distribution of damage during the M w 6.8 2003 Boumerdes earthquake. Finally, the same analysis is performed by using response spectra rather than Fourier spectra and leads to the same conclusions. Moreover, the calculation of the response spectra is more easily compared with the smoothing operation of the Fourier spectra. We thank CGS accelerograph network operators S. Larbes and D. Haddouche. We express our sincere gratitude to two anonymous reviewers for their valuable contributions, suggestions, and comments in improving the scientific quality of this paper. Parolai, S., Picozzi, M., Richwalski, S.M., Milkereit, C. (2005), Joint inversion of phase velocity dispersion and H/V ratio curves from seismic noise recordings using a genetic algorithm, considering higher modes, Geophysical research letters 32. doi: 10.1029/2004GL021115.